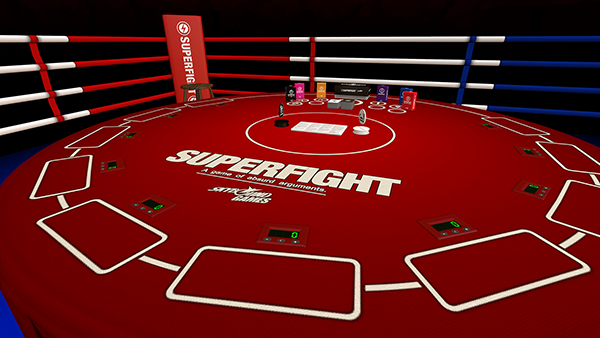 06/03/2016 – Update v7.4 Alpha VR Support, Zombicide DLC & Updated Superfight DLC! VR Support is here! We’re happy to announce that the first iteration of VR with the HTC Vive is now live. Please remember that VR is currently in alpha, so we could use all the testing we can get. Post your feedback on our official forums or the new VR sub-forum on Steam. When you start up Tabletop Simulator, you will get a pop up box so you can choose whether to play in VR mode or the normal mode. VR + PC users can play together no problem! We’re also happy that our latest DLC, Zombicide, is now released! Remember to subscribe to our newsletter to get the latest news and updates. We send out a newsletter just once a month. This support is considered an alpha test, we are getting it out early so we can get feedback as soon as possible. Note: Mods with tons of assets might lag the game enough to make them unplayable with VR, we cannot ensure a smooth experience on mods. All of our content including DLCs should run fine on the recommended VR specs everyone is used to. Test it out and post all feedback, suggestions and issues on our forums. You can picked up objects two ways, either using the laser pointer or picking up like you would in real life. While holding an object you can swap between the two methods (laser or held) by pressing the grip button. If you want a closer look at an object, hover over the object and press the grip button (ALT Zoom). The virtual dpad has 5 actions mapped to it: Flip (Down), Rotate Left (Left), Rotate Right (Right), Raise / Randomize (Up), and Teleport (Center). All dpad actions besides teleport can be used when holding or hovering over an object(s). Teleporting is done by holding down center and then using the trigger to teleport to the destination. Box selection to pick up multiple items can be done by dragging a box using the trigger (Highlighting not yet implemented). The menu button can be used to bring up the escape menu or the contextual menu when hovering over an object. Currently, you’ll have to use a keyboard for any typing (inputting passwords, etc). Our latest game Zombicide by Cool Mini or Not is now released as DLC. The regular price is $9.99 but there is a 30% launch discount for the week. 1-6 players, 14 & up. Like all our DLCs, only the host needs to own the game for everyone else to play. 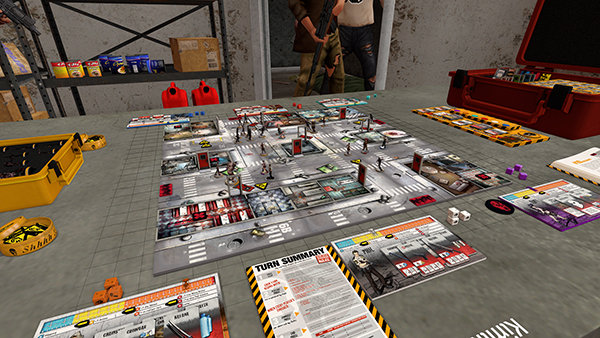 The “Gizmo-Tron 9000” on the table uses states to add various missions on the mission board to help set up your games. Hover over it for info. 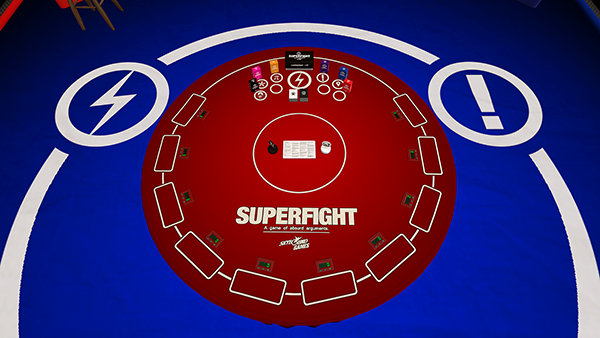 Updated Superfight to have a proper theme like all of our other DLCs. 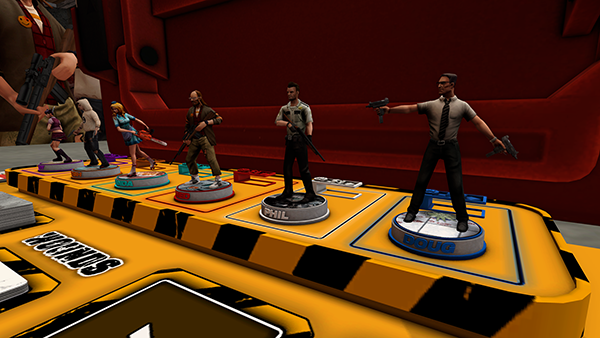 2 extra seats were added to allow up to 10 players. Counters added to the table to keep score easily. Active player markers “Champion” & “Challenger” added to go with the theme. Fixed issue with Lua interactable not working on clients. Automatically subscribe to a mod you uploaded and download it right away. Automatically download the update for a mod you just updated. Removed Public Searching as it was very buggy all around. The new private search was meant to replace the old one. Removed physics explosion being possible if moving an object quickly through another, then dropping it. Added an error message if a user tries to use an image larger than 10k. Optimized network traffic for syncing pointer positions. The confirmation dialog now stands out more by darkening the background. Fixed issue with ALT Zoom not working for infinite custom objects.